Ian & Amanda, Chris & Joan Warner and our two resident Spaniels Ozzie & Apollo welcome you to Sonachan House bed & breakfast. We are in a quiet area of Paignton, the heart of the English Riviera, which lies between Torquay and Brixham. From our B&B you can walk to two lovely beaches (Paignton & Goodrington) and to the South West Coast Path within 10 minutes. Paignton Zoo is 5 minutes away by car or a 20 minute walk. Paignton town centre and the Dartmouth Steam Railway are also only a 10 minute walk away. We are a family-run, licensed guest house and offer lovely accommodation in a home from home atmosphere. For your convenience we offer B&B or Room Only. Book Direct, by phone or through our website for Best Prices. Our Accommodation has eight en-suite bedrooms all of which are centrally heated and have a flat screen, digital television and beverage tray. We have a selection of rooms available, from a single to a family room for five persons. For details of the variety of rooms please see here. We are sure that we will have the accommodation that meets your requirements. We also have a number of cots and baby listening monitors for your convenience. We have a well stocked bar including a selection of Real Ales from Paignton’s local brewery, Bays Brewery. We also sell their Windfall Cider made from 100% West Country apples. You are more than welcome to relax in our TV lounge with its comfy seating. There are also plenty of toys and games for those rare wet days, or to keep the children amused whilst you relax in the bar. Guests are welcome to enjoy our gardens, including our fantastic deck, where you can relax and take in the peace & quiet whilst you have a pot of tea or something stronger! We no longer provide evening meals as there are a large number of restaurants in Paignton and Goodrington which are only a 10–15 minute walk away. If you prefer not to eat out we have a number of take away menus available and we are happy for guests to use our dining room or garden. We will supply crockery and cutlery and happily serve you with drinks from our bar! There is so much to see and do on the English Riviera (Torquay, Paignton and Brixham) for details see here. We look forward to welcoming you to stay! 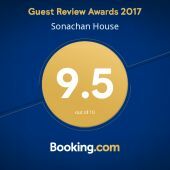 Book Smart and Book Direct - our best prices are on our website and will not be beaten elsewhere.